Want to Grow Up Big and Strong? Think Design. Perhaps it’s the way we romanticize them, or we are blinded by stories of staggering success, but when people discuss startups one crucial detail is often left out: 90 percent of them fail. The statistic is gloomy, but it shouldn’t come as a surprise. Even in some of the world’s largest companies, where teams of people spend their time dreaming up the next big thing, very few innovative ideas ever see the light of day. Of course, no one overarching truth can explain why, but there is an underlying factor that might get close: somewhere along the way, they lost sight of the user. At SAP’s Design and Co-Innovation Center (DCC), we work to help companies big and small avoid that mistake by practicing and teaching the principles of design-thinking. While perhaps design alone can’t deliver on the promise of innovation, the frameworks fundamental to a design-centric approach provide the methodologies and mindset required for winning solutions that put the customer first. Ignoring design principles can mean the death of any innovation, but the stakes are even higher for startups that don’t have the luxury of failure. This was on display recently at AppHaus Palo Alto when the DCC hosted a design-thinking workshop for an enterprise software startup looking to learn from our expertise. During these early stages, organizations like his make company-defining decisions every day. But when things are happening so quickly and you are always concerned with whether a feature can scale rather than whether it’s right, it’s easy to lose sight of the customer — arguably the most important factor contributing to long-term success. While many companies that are just starting out pick a direction, ignore all warning signs and go full steam ahead only to eventually crash and burn, Vinay understood how essential it is to define a company on the customer’s terms and build great products that resonate. Coming off a strategic turning point that changed the direction and character of their business, Vinay brought the rest of his team at Zenyx, a cloud and mobile solution that saves time at work by keeping everyone better informed, connected and organized, to SAP’s AppHaus Palo Alto to work with the leaders in enterprise design services. 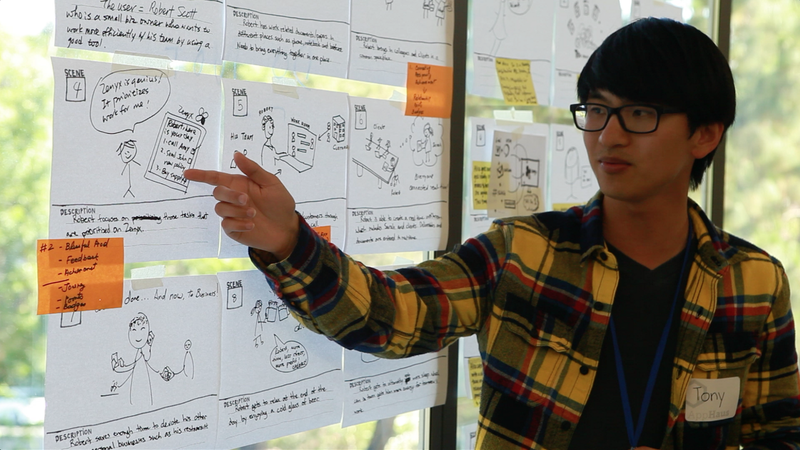 There, amidst whiteboards, among the trees and with guidance from team of design “coaches” from the Design & Co-Innovation Center (DCC), the young company was able to take a step back, reboot and redirect, eventually coming to see their target consumer — and themselves — in a new light at a critical time. It’s easy to think that great ideas and insights strike at random, but that’s rarely how truly successful innovation works. Like most things, it takes time and effort to grow companies and get the most out of the ideas they are founded on. In design thinking, organizations have discovered a methodology to do just that. But, as Vinay professed, for those unfamiliar with how the process works or without sufficient time or resources, a little guidance goes a long way. During the workshop, the team generated, validated, and visually documented ideas and concepts about Zenyx’s customer base and began to see how they could better cater their product to their customers. While great design is one of, if not the, most important competitive advantages companies lean on these days, being design-centric goes beyond just products. Instead, for design and innovation to be sustainable and scale, companies must place design and design-thinking at the very heart of their organizational culture. Moving forward, Zenyx plans to actively apply a design-oriented methodology to its business practices, leaning on lessons learned with the DCC at the AppHaus.